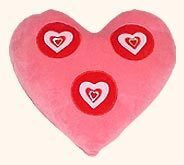 This is a special category of cushions, pillows and bolsters for kids who really get amazed by heart shapes. Under the category of wonder hearts, we manufacture these products that are comfortable and attractive. If you are planning to set up the a bed for your kid then they will add to the attraction. Kids play with cushions so we use the fabrics that are easy to clean. Desc : A heart touching gift for little ones. 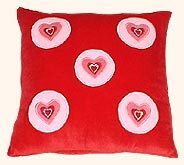 This pink colored heart shaped cushion features three designs of heart in red circles. 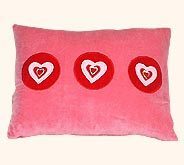 Desc : These heart design rectangular cushions add a touch of comfort and beauty to the decor of kids' room. 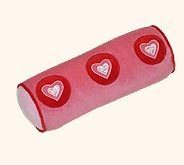 Desc : Heart print bolster pillows are made from super soft fabric keeping into consideration the soft body of children. Desc : This rectangular pillow boasts captivating printed patterns of heart in pink circles. This light weighted pillow is very durable in quality. Desc : These pink colored printed pillows are appealing with their heart design in circle of center and elegant tassels all over the borders.